One of a handful of important tools in my shop are routers. No, I don’t have routers sitting on shelves circling my shop as did Mr. Abram during his long-running show, but I do own more than a few. I have them not for show, but because they do almost any job you ask. 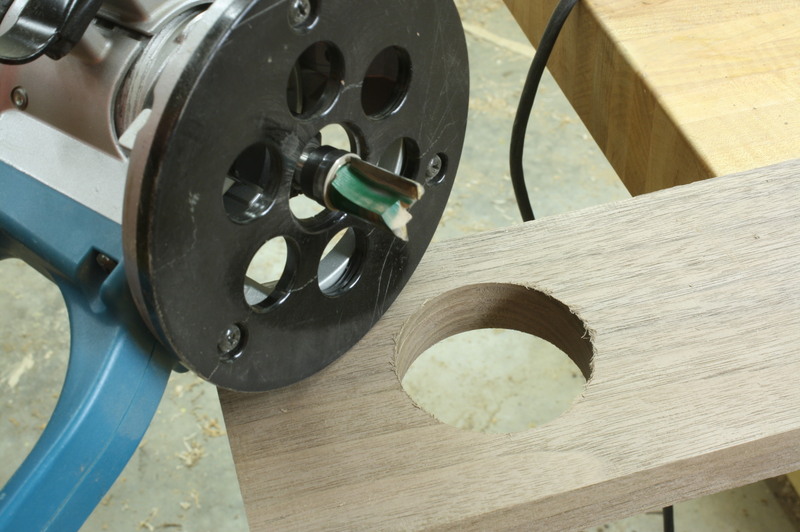 When I teach routers I run through many of these uses, such as plowing grooves and dados, sliding dovetails, hogging out waste between pins, edge profiles and more. One fun technique that I always demonstrated toward the end of the seminar was how to enlarge a hole using routers. I found this technique fun, but not all that practical. How many times do you need to enlarge a hole to a specific diameter? I do this occasionally whenever I need to hang pipe or duct-work for dust collection, and mostly that’s about all. But as I worked on a secretary interior recently, I discovered how I could put this technique to use. What makes this technique valuable is that you can step from any diameter hole to a desired-diameter hole by adjusting your rabbet size. In the photos, I took a 1-3/4″ hole and moved to a 2-3/4″ diameter hole. A second run through the process would take my hole to 3-3/4″ in diameter due to the fact that I had my rabbet bit set for a 1/2″ rabbet. If a rabbet bit were set for a 3/8″ rabbet, the hole would move from 1-3/4″ to 2-1/2″ (+3/4″). 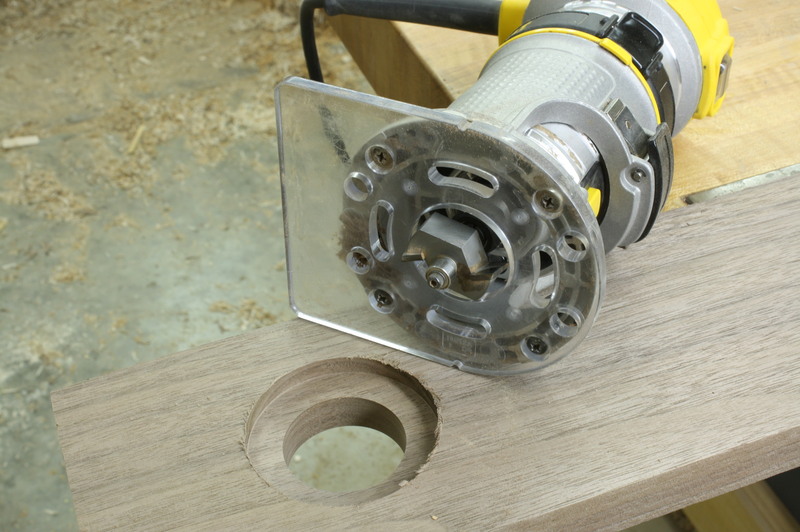 A second run through would produce a hole with a 3-1/4″ diameter (+3/4″). Any size step is possible. You can combine any different rabbet bit setups to get to exactly the size diameter you want – one pass with a 3/8″ bit and a second using a 1/2″ rabbet bit would increase your diameter by 1-3/4″ (3/8″ + 1/2″ x 2). Nice little technique, but how is this going to help with my secretary interior? In the top photo, the bottom and middle shelves have the exact same profile except that the middle shelf steps back a 1/2″ exactly. Not simply back at all the straight areas – each curve also steps outward, too. I could have developed a second pattern (as discussed a few weeks back in my “Are Full-size Plans Available?” post), traced the pattern onto my shelf, then cut the shape at my band saw. 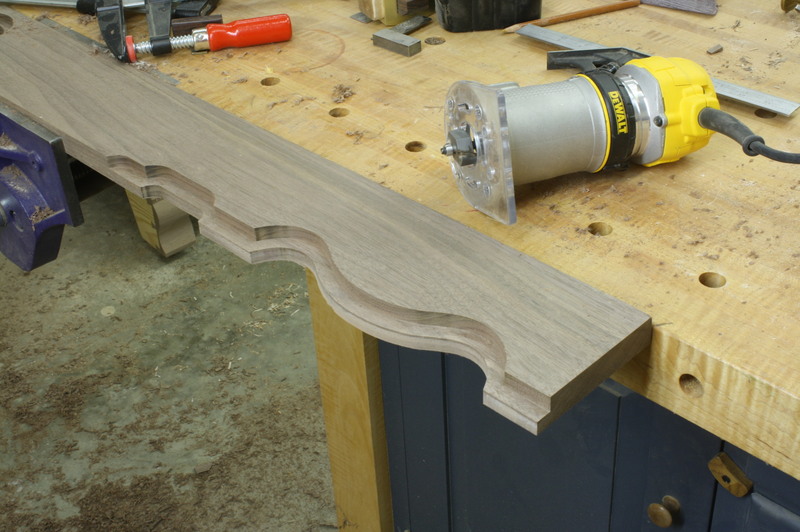 Instead, I used this rabbet/router technique and had a completed shelf in two quick steps. I cannot believe it took me this long to put this technique to use. This is a simple process to use and can really save you time in the shop, but I will add a caveat. It’s important to watch the direction of your grain and the undulating profile as you rout (work from high to low as you would when turning at your lathe). Also, I found it best to climb-cut most of the shape as I worked to keep from splitting out wood in chunks.